We have the right to die, but not the right to commit suicide. This makes my life in Consult Psychiatry extremely difficult, especially when someone has an Advance Directive that states "Do-Not-Resusciate" and then they try to kill themselves. They arrive at the hospital in critical condition, the medical team knows the need to be intubated and they are likely going to go into cardiac arrest. Should they intubate them and save them because suicide is illegal, and the person may want to live when they are not in crisis? Or do the doctor's let the patient die because of the patient's pre-written wishes? Worse yet - what if the person didn't have an advance directive, but when they are crashing in the hospital, they tell the whole medical team that they refuse CPR and intubation. Does a person who just attempted suicide have the capacity to make that decision? So here's my question: okay, it's one thing if someone checks into a hotel room, makes a serious attempt, notifies no one, has an Advance Directive in their hand and a DNR order tattoo'd on their forehead, but oops, the maid finds them. That's it's own touchy issue -- unless you're their wife or mother or son, in which case I don't think it's a question at all. But what do we do about the patient who overdoses, then emerges from the bathroom to tell their significant other "I just took all my pills". Or the person who makes an attempt then dials 911 or goes to the ER. How do you stand there and let someone die because they have a piece of paper saying they don't want CPR or intubation? Is it really reasonable to have this type of attempt and announce it? Isn't there an element of cruelty to it? So many people attempt suicide and wake up glad to be alive. 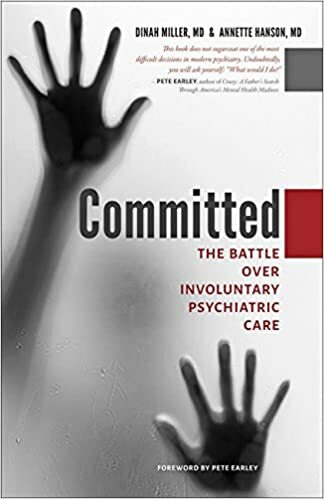 I'm going to add that I don't believe Advance Directives made by people without psychiatric disorders are binding if the patient does not have a terminal illness. A healthy person can't go into a routine appendectomy or tonsillectomy and say "if something goes wrong, you can't even attempt to resuscitate me." No surgeon or anesthesiologist would ever accept that malpractice risk. --"I'm so sorry Mr. Smith, buy your 20 year old son had a tension pneumothorax during the procedure, and we could have intubated him and put in a chest tube, and he'd have spent a couple of the days in the ICU then made a full recovery, but he said no tubes/no intubation." Advance Directives are meant for situations where someone has a terminal condition -- cancer or Alzheimer's Disease, or AIDS. And what would we do about children? Would we allow a parent to make a healthy child DNR in the event of treatable illness? The Right To Die. Maybe. Sometimes. If You Don't Change Your Mind. Today. 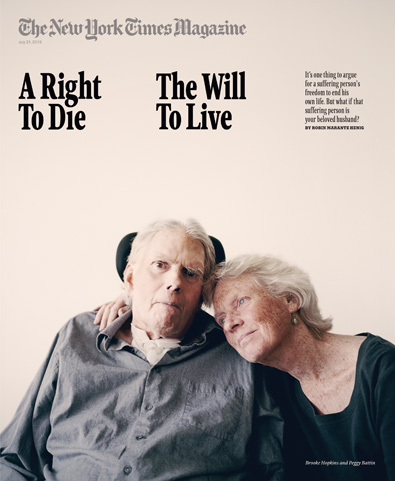 Great article in the New York Times Magazine, called A Life-or-Death Decision, by Robin Maranz Henig, about an ethicist Peggy Battin, who teaches and writes on the right to self-determination and end of life decisions. Her husband, also a college professor, suffered a severe head injury while bike riding, leaving him a wheel-chair bound, machine dependent quadriplegic, a year after he'd written a living will forbidding the use of "measures to unnaturally prolong or postpone the dying process." 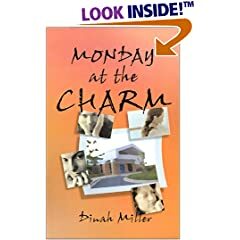 In the years since the accident in 2008, her husband, Brooke Hopkins, has required around the clock care to maintain his breathing, a feeding tube, and an enormously expensive motorized wheelchair for mobility, and a quarter of a million dollars a year spent on 12 aides who help him around the clock. He's been in and out of the hospital, and what's striking is that from the time Dr. Hopkins wrote his advance directive, he changed his mind. Now the couple struggle with the dynamic that sometimes he says he wants to die, his wife ignores his requests because she believes he doesn't really mean it, and generally he later says that in fact, he's glad measures were taken that kept him alive. Dr. Brooke is able to read with a voice-commanded computer screen and co-teaches a courses in his home. I'm all in favor of advance directives and the right to die with dignity in a situation where healthcare prolongs the inevitable death. This story, however, was extremely confusing. One member of the couple is a bioethicist whose career has revolved around these issues. The other is a gentleman with a head injury, an impaired lifestyle requiring extreme measures of support, a general (or so portrayed) happy and positive outlook who is still culling meaning from life and contributing to society, and yet, there is no absolute way he can say "enough" ( he tried in a Final Letter) because any such statements are felt to be transient, reflective of a momentary state of distress that will pass, and so in a Catch-22, it's not quite clear that he can ever practice what his wife teaches. I will mention that the article had a single passing reference to the fact that Dr. Hopkins (Ph.D. from Harvard, athlete, risk taker, life of the party, and esteemed college professor) suffered from bipolar disorder, and aside from that single mention, it was never part of the discussion as to why he shouldn't call the shots on his life, have an advance directive, or called into question as a reason why he might be changing his mind about wanting to live or to die. Bipolar disorder got a mention, but it does not sound to be what defines Dr. Hopkins. So what do you think? How do we ever really know for sure what someone wants if they change their mind or waiver during moments of crisis? Paul McHugh, MD, esteemed past Chair of Psychiatry at Johns Hopkins, writes in the criticism from Tom Insel from NIMH. Paul eloquently explained his point, which makes a lot of sense. With its new manual, the APA might instead have started taking steps toward a system of classification that, as in medicine, organizes disorders according to what we know about their natures and causes. Such knowledge, rather than checklists of symptoms, would then direct treatment and research. Psychiatrists know, for instance, that depression and anxiety can derive from a number of different sources: cerebral diseases such as schizophrenia and bipolar disorder; alcoholism or drug addiction; experiences of loss, deprivation or trauma; and, more generally, a vulnerable temperament, characterized by introversion, shyness and emotional intensity. Deciding which of these sources, alone or in combination, applies to a particular patient requires hours of evaluation. Prescribing an appropriate treatment involves not checking symptoms but determining who the patient is and what he or she has experienced and done. DSM-5 displays none of this thinking. It remains a field guide organized by symptoms, clustered in categories that can expand without limit. 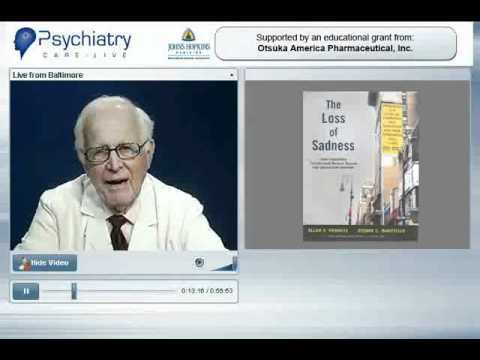 Official, APA-approved psychiatry seems to lack the will to change. It justifies its stagnation not only by reminding its members of the chaos of the 1970s but by claiming that the U.S. health system would not pay psychiatrists if they tried to know their patients the way that they could and should. I have not seen the issue of DSM5 updates discussed in all the recent rancor. Some of you may know that the DSM5 is expected to have periodic updates, e.g., 5.1, 5.2, 5.3, etc., not unlike how Apple's OS X comes out with a new "point" version every year or two. I expect that, as delineated causes of different psychiatric disorders arise with new research, these will be added to future incremental updates. However, both Drs Insel and McHugh have valid criticisms that the new version, released today and already #12 on Amazon's bestseller list, missed an opportunity to reframe the organization of illnesses based on causes, not symptoms. We'll have to wait to see how the generated heat tempers the 5.1 version, mishegas notwithstanding. These days, ClinkShrink and I are talking about very different things over on Clinical Psychiatry News. Clink is setting some guidelines for how one might go about determining if a prisoner has been coerced to go on a hunger strike. You can read about that in Assessing Coercion Among Hunger Strikers: A Primer. For those of us who are a little less specialized, I wrote an article a few weeks ago about My Life/Your Life and self-disclosure by the therapist during tough times. See The Delicate Balance of Self-Disclosure. These lines are from Scottish poet Robert Burns. He could well have added that we might have the gift to see better what others mean by their acts and words. Two sides of the same coin, perhaps, but very important in trying to understand the issues of involuntary hospitalization that are often discussed here. Yesterday Dinah and her husband joined me and my wife to see HMS Pinafore, and at intermission I commented to Dinah that in today’s culture one of those sisters, cousins or aunts might have called 911 when Ralph Rackstraw talked of suicide: he had the means, he expressed intent, and he believed Josephine did not love him. How differently the play would have gone if he had been quickly certified for observation in the local hospital (see Hogarth’s portrait of Bedlam in “A Rake’s Progress”)! Recently I have heard of numbers of people (some SR regulars) who were hospitalized without what appears to have been good reason, and then were treated quite harshly and callously on the ward: forced medication and humiliation, which took quite a toll on them. I have no reason to doubt their experiences, but do not understand what exactly transpired. It led me to ponder more on how we come across to others, and in telling our version of events what is it we stress or do not, what we understand of the other person’s perspective, what they would react to, or not. Have you ever had the experience of meeting someone, engaging in a spirited conversation, and then later hearing from a mutual friend the other person’s version of what went on (if you say “no” think back to dates you had in college)? This failure in empathy and understanding can occur on both sides, but I suspect it is almost always there in some form. Each person sees only a part of the full picture, or reports it in a manner different from how the other would tell it. So when someone writes that he did mention to the doctor in the ER that he was having suicidal thoughts but expressed no plan, and was then certified, I wonder what the doctor or others had heard and observed. I wonder what unknown pressures the ER personnel are under, what might have happened recently, what went on in their own lives. At times when people write that they had turned up in an ER I wonder why, and what concerns and fears they had created in others, of which they were unaware. post we could stay with the question of perception of ourselves and others, as opposed to the many other directions in which the comments might go. In psychiatry, we are sensitive to issues of stigma. It's no longer cool to openly discuss disdain for people who belong to other races, who are gay, who are handicapped, and I think we're making progress in some areas of mental illness. It seems that people feel free to say the problem is the 'crazy people' and not the guns, but in general, we don't really condemn people people because they've been depressed or had panic attacks. I sometimes think that the last group of people that it's fine to blame for their plight are the obese. Okay, and alcoholics, those with drug addictions. and smokers. They aren't victims, they just lack self-control, and if only they'd try harder. We've gotten over telling people to stop being gay or stop being psychotic (even if some members of society don't want to stand next to them). But when it comes to those with obesity or addictive issues, their problems are their fault, so it's fine to blame them. If you've ever felt contempt for anyone who is too heavy, or had the thought, "Of course they have (fill in the blank) problem because that happens to fat, lazy people with no self-discipline," or even just thought, 'If being fat bothered him, I guess he'd eat less," then please watch this TED talk, he's great. And yes, I think it's fine that the AMA declared obesity a disease, I don't think anyone is going to gain weight because now they have an excuse they can blame it on. It's time medicine became more sympathetic and aggressive about finding treatments that work for obesity, alcoholism, and drug addiction. Sorry, I'm preaching. Watch the video, he's says it better than I ever could. The Stress Doc from fraser fraze on Vimeo. Our last guest blogger, Dr. Moto-Castillo sent this to me. Oy, is it bad. But perhaps worth a laugh or two? None of the Shrink Rappers have anything to do with this.